Shark-Design. If mini, then at least with style. The swinging forms are conspicuous, the case is grippy in the hand, and the matte HD Ready display gives good oversight of the desktop. Does the Dual-Core shark also impress in terms of battery life? 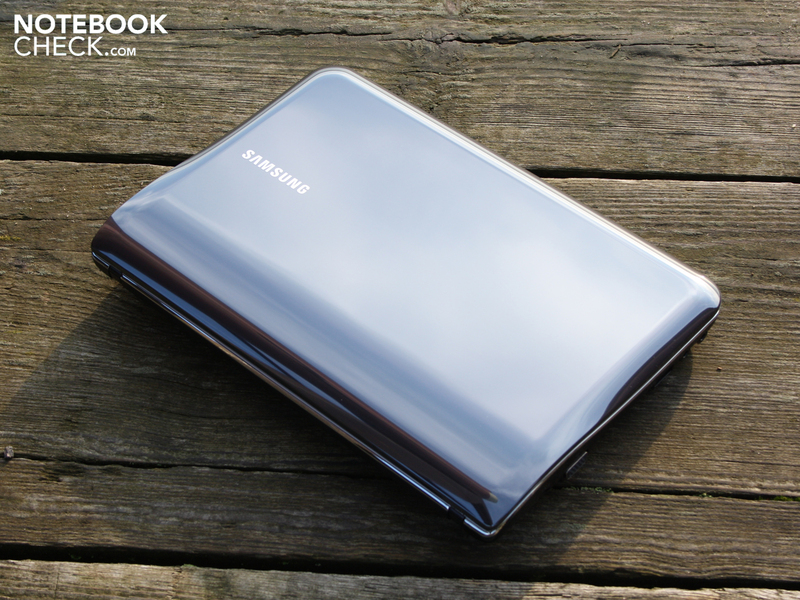 Samsung looks ahead and announces that all new Netbook models will be equipped with a Dual Core Atom at the IFA 2010. 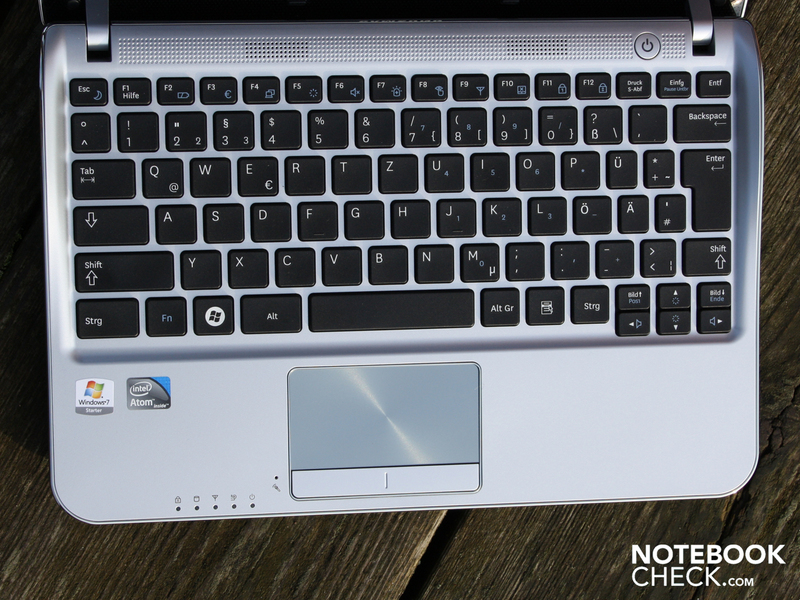 In review is the NF310-A01DE with an Atom N550 (2 x 1.5 GHz), DDR3 RAM, 250 GB hard drive, and Bluetooth 3.0+HS. 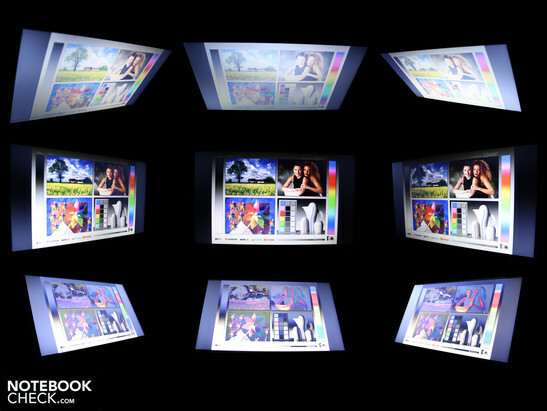 A special highlight is the matte HD Ready display with a resolution of 1366x768 pixels. Working with good oversight could therefore be possible with a 10.1 inch Netbook from now on. The same technical specifications (except for HD Ready) could already impress with the Acer Aspire One D255 (N550). 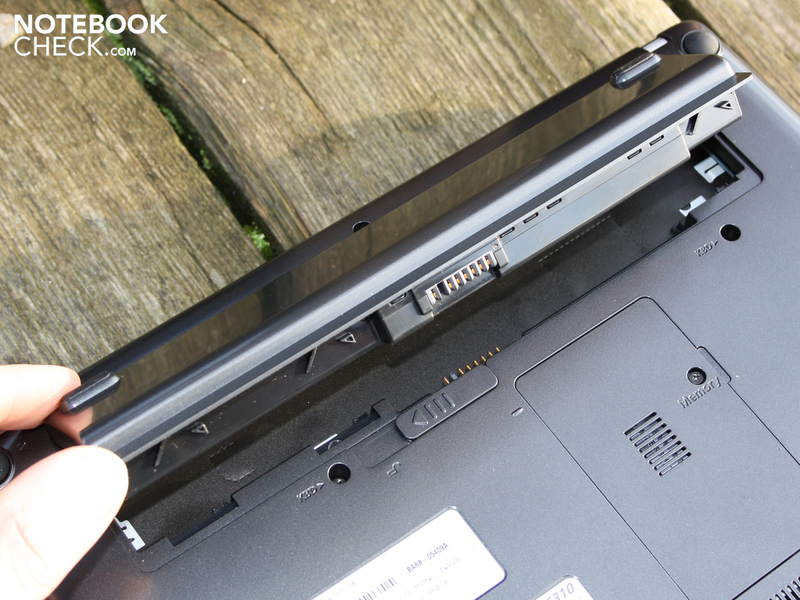 The Netbook competitor delivered a battery life of 6.35 hours (WLAN test) despite two Atom cores. Can Samsung keep up? Samsung wants to sell more than a plastic box with a mainboard. The manufacturer therefore touts a "unique case with luxurious colors". And on top of this, the "dynamic design [...] provides you with a positive attitude", according to the product web page. 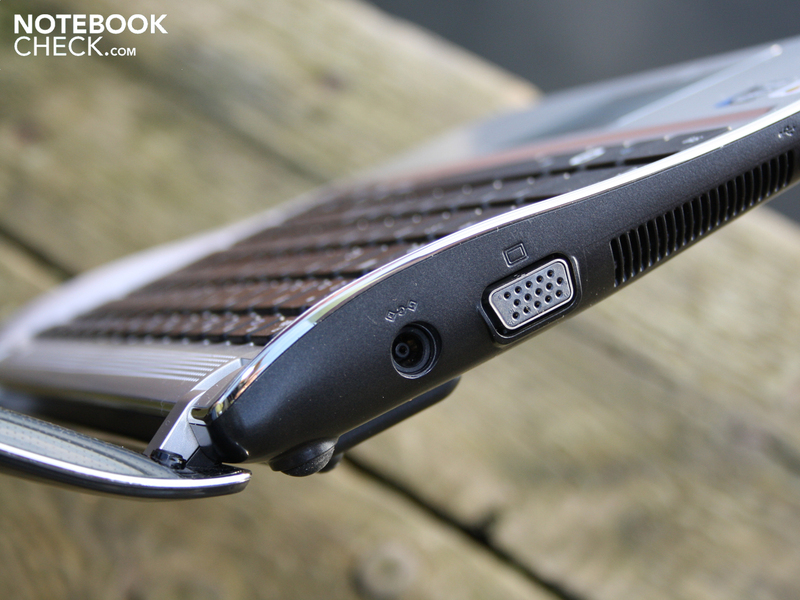 Backed by so much marketing wording, the 10.1 inch Netbook with a curvy style is now in front of us. Without question, no manufacturer has so far been bold enough to produce such a shark-design. Even the 15.6 inch Notebook SF510 was given the shark look. The look is a matter of taste, but we also discovered a practical use for both of the raised edges on the left and right sides of the keyboard. When lifting or holding the device, we automatically grab it with the thumb over the swung edge. This provides a perfect holding area, without pressing any buttons. The base unit is very thin at the front around the palm resting area, which time and again surprises when lifting. In return the rear is noticeably thicker due to the overhanging battery. Despite the firm base of the keyboard and firm palm resting area, the chassis construction is not as rigid anymore as that of the Samsung N220 or the N230 (premium models). With both hands the base unit can be bent within limits. The deeply hung hinges sit firmly on the base unit. They hold the lid firmly and therefore don't tend to allow the display to teeter (both hands required to open). The good rigidity of the lid construction is a further advantage. The maximum opening angle is not especially big though at 130 degrees. 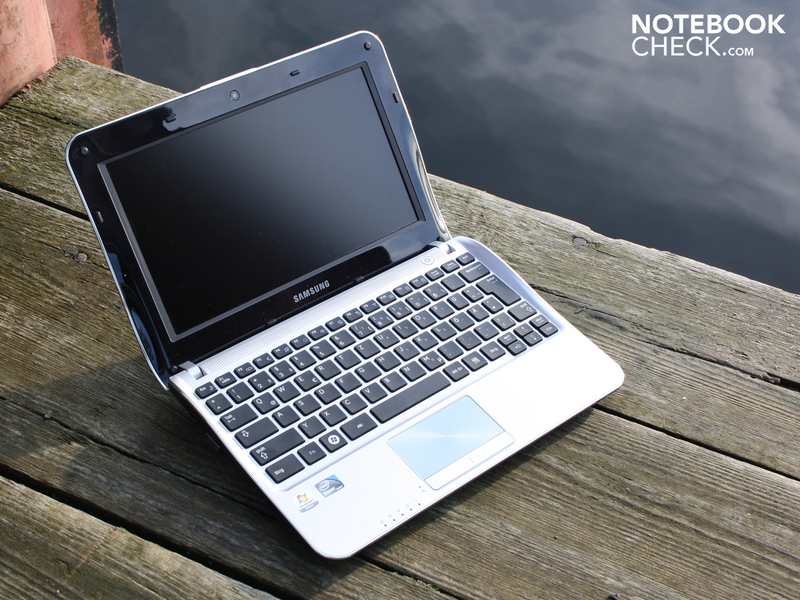 Samsung's NF310 offers exactly the minimum required, that is available in almost all Netbooks: VGA, 3 x USB 2.0, Ethernet, card reader, and 2 x audio. Open the display and get started. Samsung names this feature Fast Start. The manufacturer simply makes the best possible use of the Windows standby mode. We experienced 2 seconds for Windows to wake up out of the energy saving mode. We were a little confused why Samsung has decided to brand the ancient standby mode as a new feature. Using this the current state has always been saved to the RAM. Since no slow hard drive is required to load the data, it only takes a few seconds for the system to be ready. The system cannot suffer a loss of power in this state though. We did this once, and current system state saved in the RAM was of course gone. In case users use the standby mode constantly, and are worried about an empty battery: If a battery is close to being completely empty following a longer sleep phase, then the contents of the RAM are written to the hard drive. The system briefly wakes up for this. This is a feature of almost all Windows Notebooks at the moment though. Next to WLAN Draft-N (Broadcom) and Bluetooth 3.0+HDR, there is also a fast Ethernet controller in the case. The Bluetooth 3.0 supports the newest standard, with which a transfer rate of 24 Mbit/s can apparently be reached (high-speed channel). The LAN controller is not state of the art though, since it cannot provide Gigabit-Ethernet (Marvell Yukon 88E8040). Integrated 3G would have been beneficial for the NF310, since combined with a high resolution, a matte display, and good battery life, all the requirements for a mobile work device would be granted. As far as the software is concerned, there is nothing included, as is currently usual with consumer Notebooks. Neither drivers nor a Recovery DVD are provided. The latter has to be made by the users themselves using an external burner, for the case that they do not want to rely on the eternal life expectancy of the recovery partition on the hard drive. Samsung doesn't leave its clients alone in this respect though. The well presented Support Center offers a series of tools: Recovery (make Recovery), Update Plus (driver updates), system programs, and user guide. The separate Easy Speed-Up Manager (Fn+F8) automatically or manually cleans up the registry. This trims the boot times from time to time. Diverse freeware tools take on this task since quite a while though. 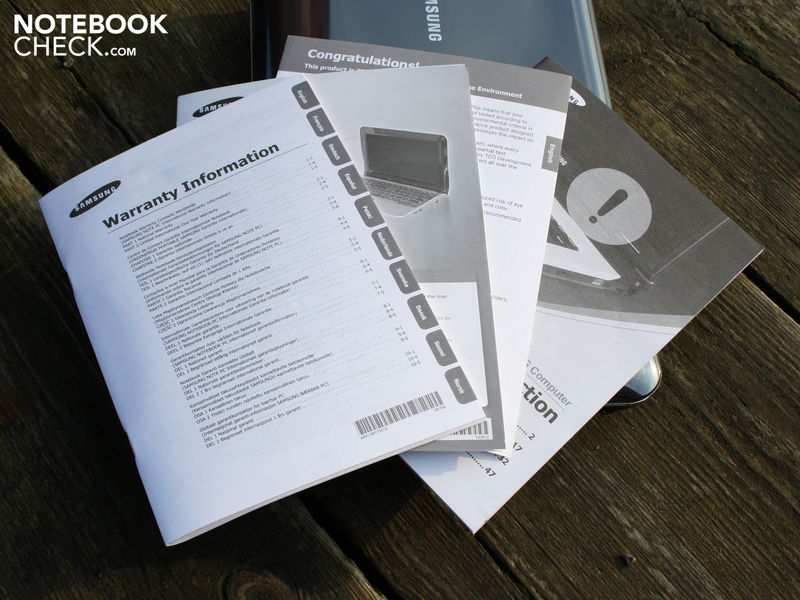 The manufacturers warranty lasts for 24 months (collect and return service). Warranty-Plus is a 1 year extension to the standard warranty, that comes at a cost of around 50 Euros. 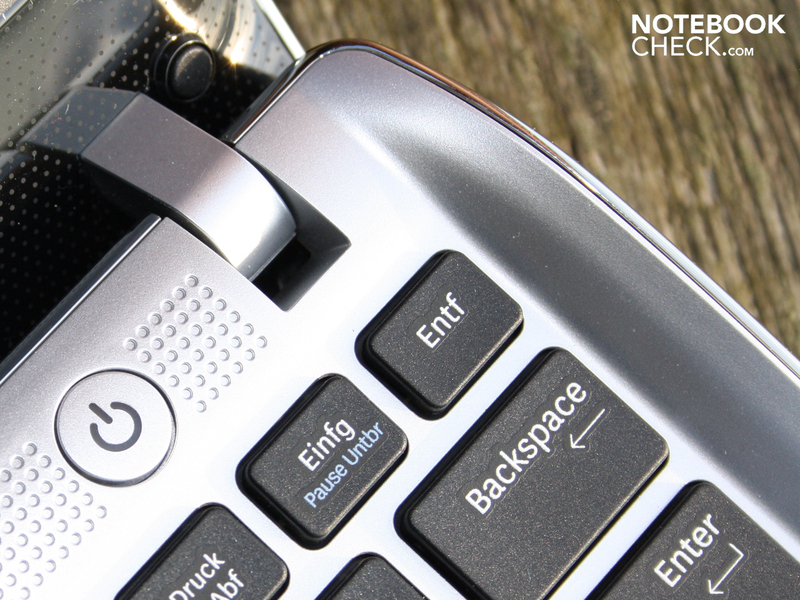 The NF310 appears with a relatively comfortable keyboard. 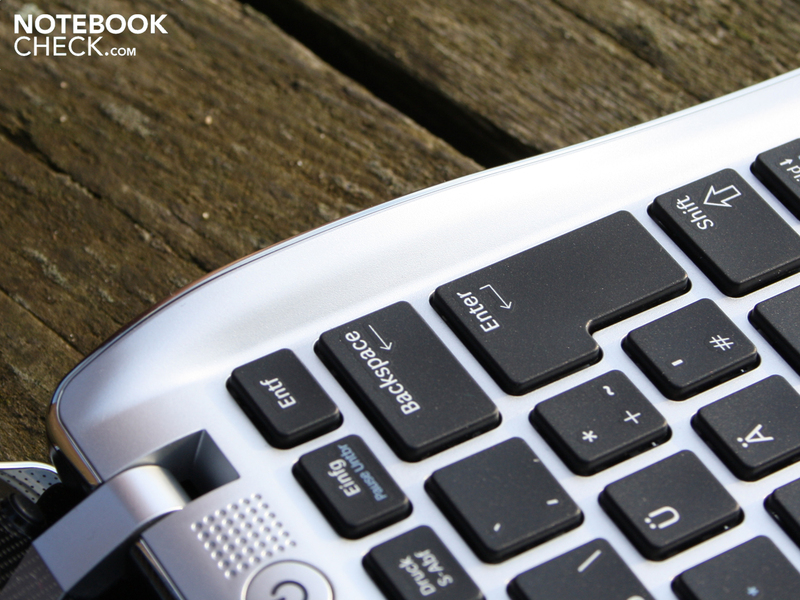 The limitations lie in the nature of the small Netbook form factor. The keys have a sufficient travel, a firm end stop on the entire surface (does not give way), but unfortunately an unclear pressure point. The keys also have sufficient gaps between each other. The usability is productive, with the only obstacle occasionally being the small right shift key. 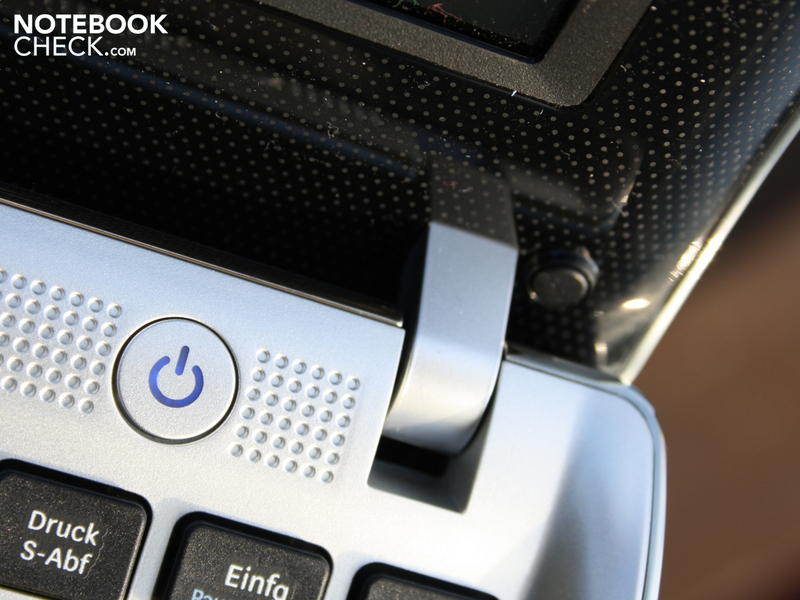 The for a Netbook typically small arrow keys (including page up/down keys), were thoughtfully merged into the palm resting area slightly. This prevents unintended pressing of the page keys. We often criticize too narrow palm resting areas on Netbooks, on which large hands slip off easily. Samsung's NF310 in contrast has an unusually deep palm resting area, on which even bigger hands will find some hold. Altogether the writing feel is accurate (gaps, layout), but has a weak feedback (unclear pressure point). The metallic shimmering Synaptics mouse replacement has a pleasant metallic feeling surface. 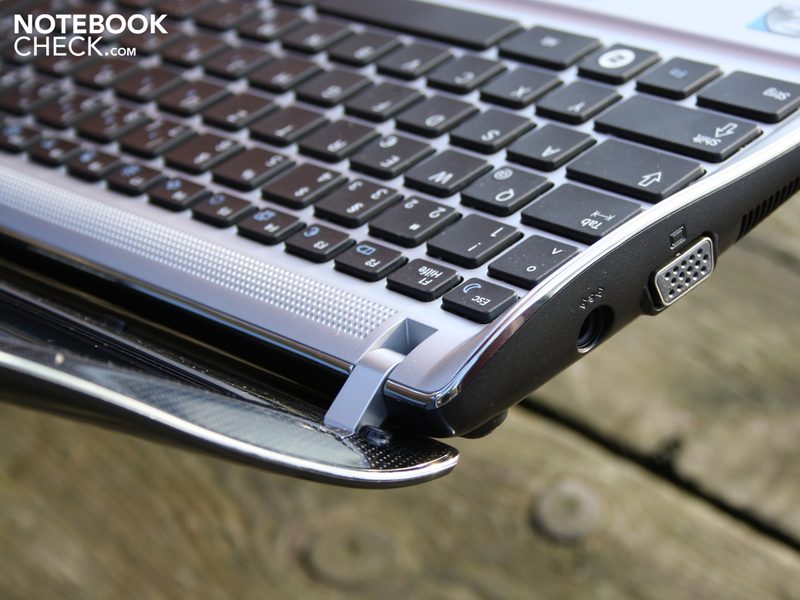 The fingers glide quickly across the touchpad without slipping. 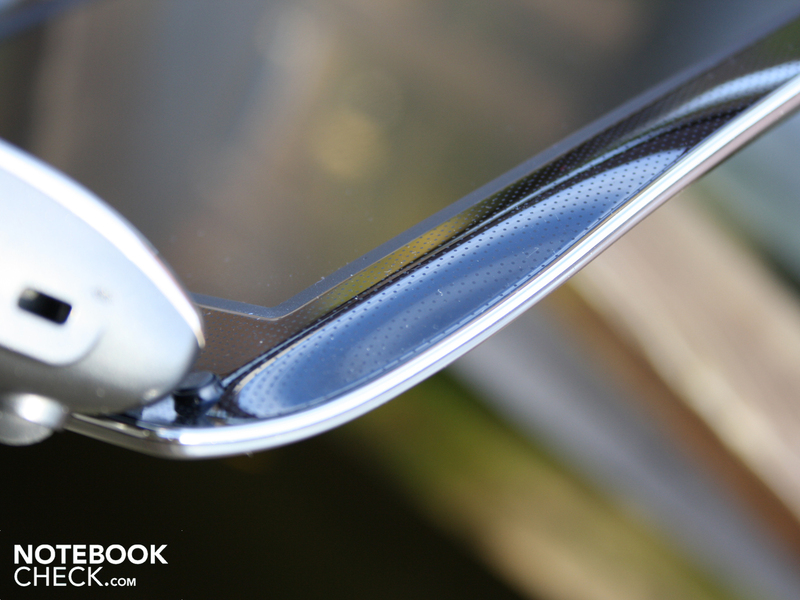 Finger prints and smudges don't stay behind on the lightly brushed surface. The Synaptics touchpad has unmarked vertical and horizontal scroll bars. 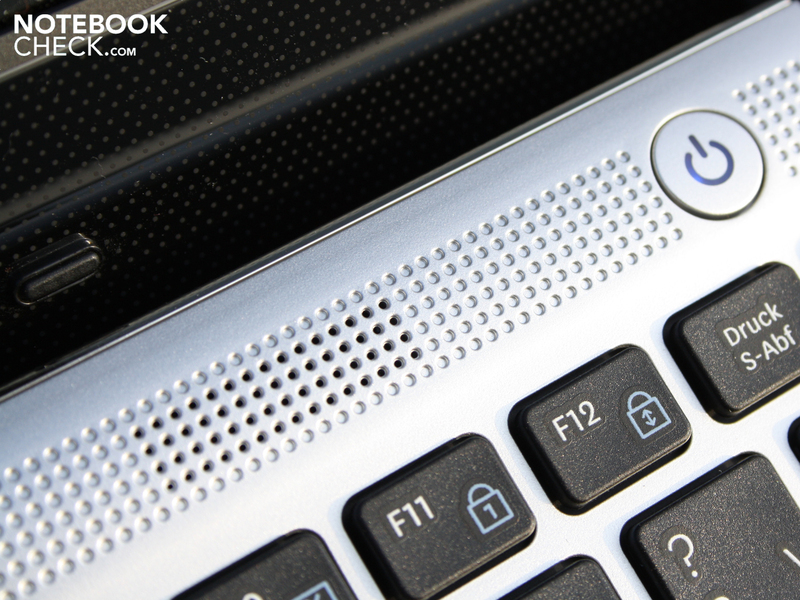 Due to it being a typical multi-touchpad, it is possible to zoom and scroll using two finger gestures. Those that do not require the fixed scroll bars, and would rather have more of the surface area available, can disable these using the Synaptics software. The single mouse button has a good travel and clear pressure point at the edges (right and left). Using the button towards the middle leads to weaker feedback with lacking button travel. At a price of 399 Euros, the high resolution WXGA panel (Samsung 101AT03-801) plays an important role in the value for money relationship of the NF310. The 1366 x 768 pixels make working easier, since users have better oversight and have to scroll less. The screen shots show notebookcheck.com in the classic WSVGA (1024 x 600) and in the HD Ready resolution of the NF310. High detail applications such as Word, Excel, or Outlook can now be used more effectively. The biggest weak spot of the matte panel is its extremely low contrast of 150:1. 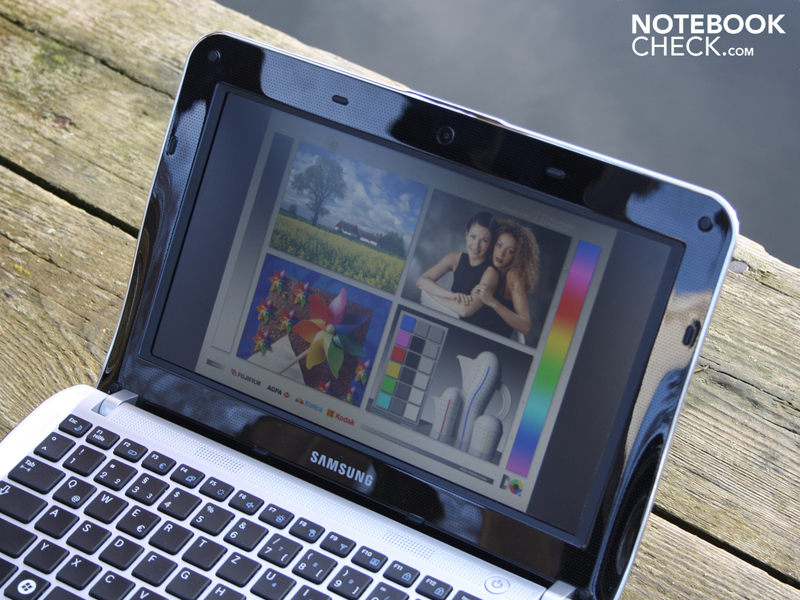 For looking at photographs or movies there are significantly better displays, at least on selected Notebooks. 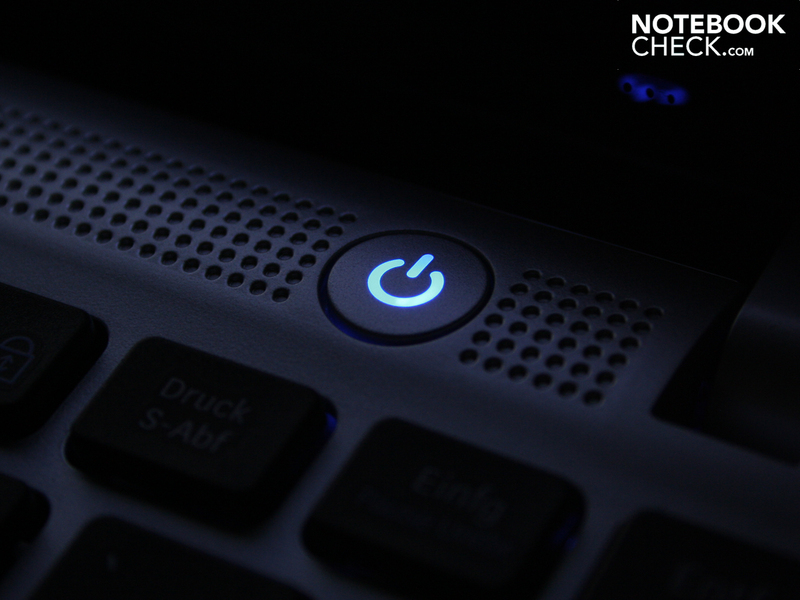 Netbooks with high contrast are extremely rare though e.g. Asus Eee PC 1001P (847:1). Looking from a professional point of view, the representable color space turns out to be extremely limited. Between the color space of the NF310, and for example the good but not perfect consumer panel in the Sony Vaio EB3Z1E/BQ(t) lie big differences. The NF310 does not suffer in our rating due to this though, since professional image editors will not want to work with a 10 inch display, even if it would have a perfect extensive color space. The non-reflective LED display is described by Samsung as SuperBright. The manufacturer has not fibbed; on average the luminance lies at 246 cd/m². Even the illumination is very even, since the Samsung panel has 259 cd/m² at the brightest point (middle), and 238 cd/m² at the least brightest point (bottom right). On a completely black or white background these areas are not recognizable. The abundant maximum luminance is complete overkill for use indoors. To prevent hurting the eyes, users will want to dim down the brightness to from 100 cd/m² to 150 cd/m². The high brightness is however immensely important for use outdoors. In conjunction with the non-reflective matte display surface, we experienced a good view from the front and limited view from the sides of the desktop under sunlight. The picture of the frontal view clearly shows how reflections on the display frame are eliminated on the display surface. 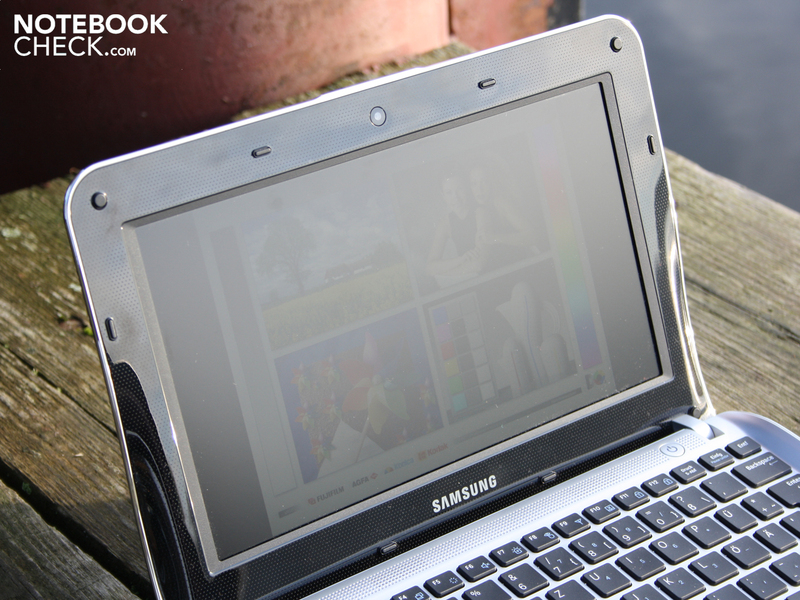 The horizontal viewing angles are on the lowest standard compared to a Notebook, with 45 degrees. Following this there are clear ghost images recognizable. Vertically the inverting-effect starts from about 15 degrees. The picture becomes noticeably darker, and the colors invert. In the dark room photographs the limited vertical viewing angles are clearly recognizable. What this means for the NF310 owner: Watching a movie alone on a train is not a problem. If another person or two want to join the fun, then the additional viewers will likely experience less than ideal pictures. Samsung has opted for the Atom N550 (2 x 1.5 GHz) Dual Core processor, which sits on the NM10-Netbook chipset from Intel. As already with the single core CPUs N450/N455, the GMA 3150 graphics is integrated into the processor. This is therefore contained in the TDP value of 8.5 Watts. The single cores N450/N455 (5.5 Watts) have an approximately three Watts lower TDP. The N550 has a DDR3 memory controller (as standard from N455), which is why one GByte PC3-8500F-RAM (a Samsung module) is used. This slot is accessible via a small panel on the bottom, and the module can be replaced by a two or four GByte version. The graphics unit GMA 3150 (clock speed 200 MHz, DirectX-9c) is not suitable for current games (often loading is not possible), and can also not help the processor with certain processing tasks (no hardware support). Whether movies do indeed stutter, or whether games do not run, is ascertained by us below under Videos and Games. Further components include a 2.5 inch hard drive from Hitachi, with 250 GBytes of storage capacity (HTS543225A7A384). The Atom N550 supports Hyper Threading as standard. Due to this the Dual Core can process up to four threads. Can this expedite multi-tasking operations that the Intel Atom in-order-architecture could not shine with previously? 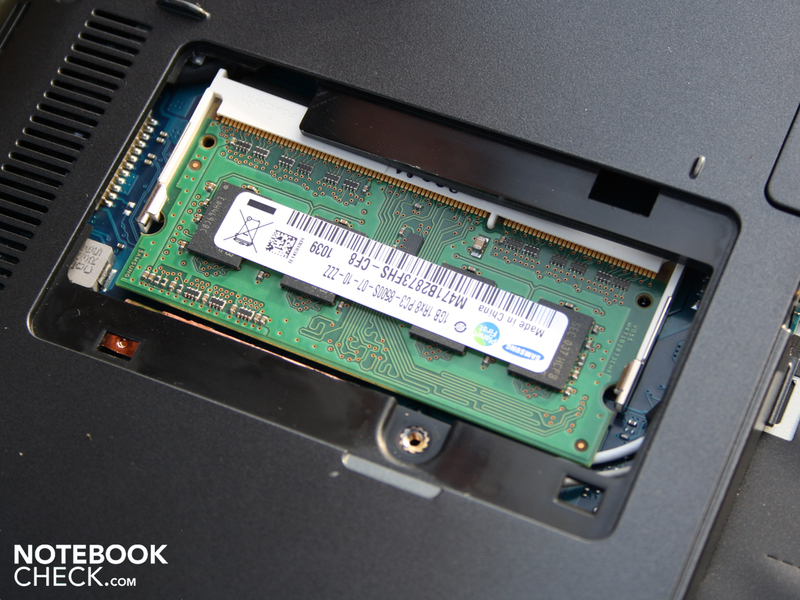 We compared the single core Atom N455/N450, that was previously included in almost all Netbooks up until now. We called on the multi-core benchmark Cinebench R10 32-bit for advice. The N550 reached 1322 points. 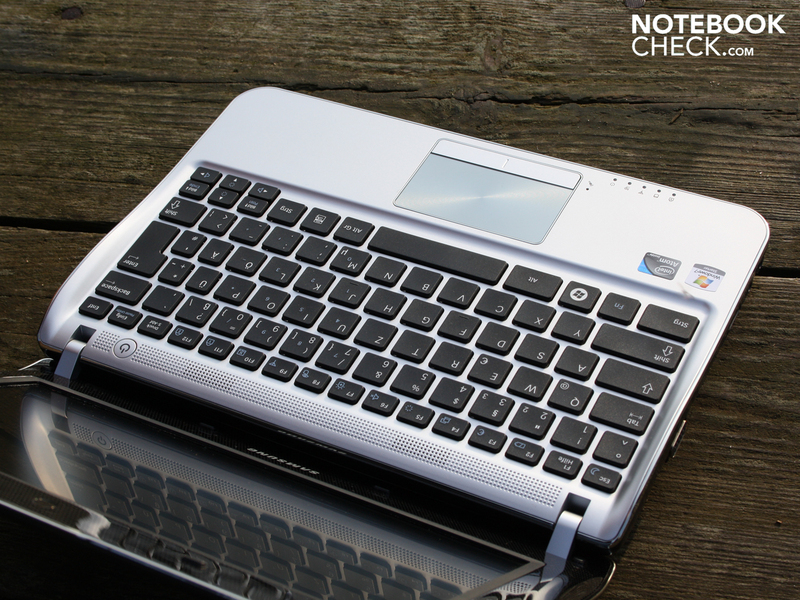 The N455 only 840 (@1.66 GHz, Acer One 533-13Drr), or 888 points (@1.7 GHz, Asus Eee PC 1016P). An N450 reaches 938 points (@1.66 GHz, Asus Eee PC 1008P). Verdict multi-core: Using all four threads (Hyper Threading) the Dual Core Atom processes 57 percent faster than a [email protected] GHz. The higher clock speed of the single core cannot prevent this. If only a single thread is processed (single core) the performance balances out again. The Cinebench R10 single 32-bit ends with 517 points. A N455 reaches 568 (@1.66 GHz), and 581 points (@1.7 GHz). The 1.5 GHz clock speed therefore doesn't pose a significant disadvantage. From a synthetic vantage point the Dual Core N550 therefore overtakes its single core colleagues without difficulties. 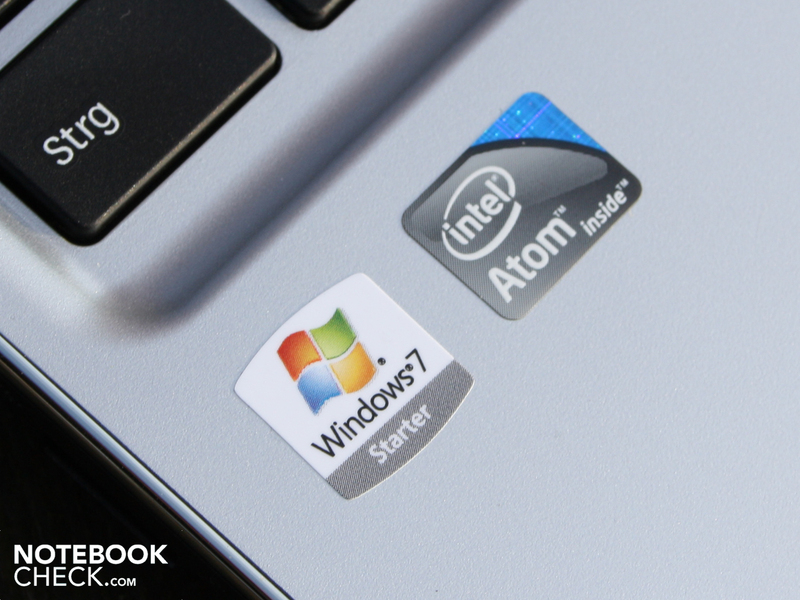 The Dual Core Atom is nevertheless still not the Ultima Ratio of the fastest Netbook. There is the AMD V105 (Eee PC 1015T), or even better the Athlon K125 (Acer Aspire One 521). These systems process faster (single core test 1491 points, K125), and achieve the same system performance score (1686 points) as our tested Samsung device in PCMark Vantage. 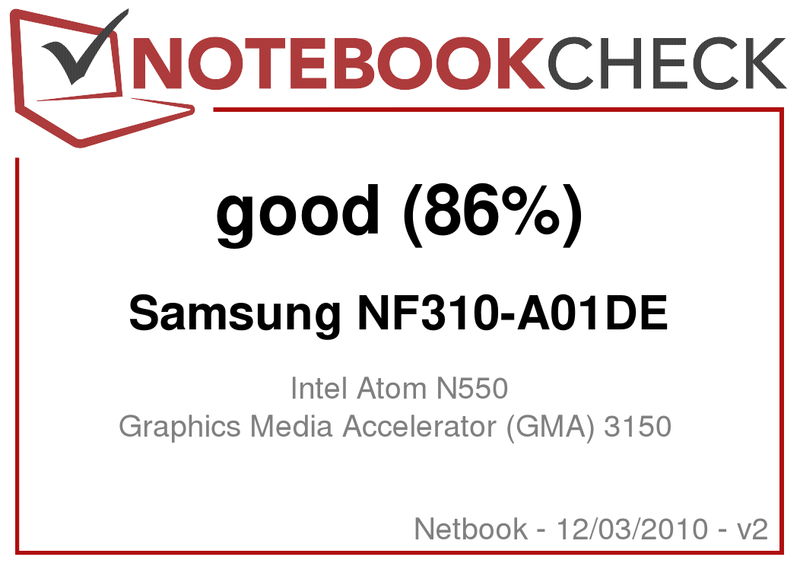 The perceived working speed of the Samsung NF310 is smoother and therefore more pleasant than compared to all the Atom single core Netbooks that we have tested so far. The system benchmark PCMark Vantage ended with 1671 points, whereby the HDD sub-score of 3070 also plays a part. 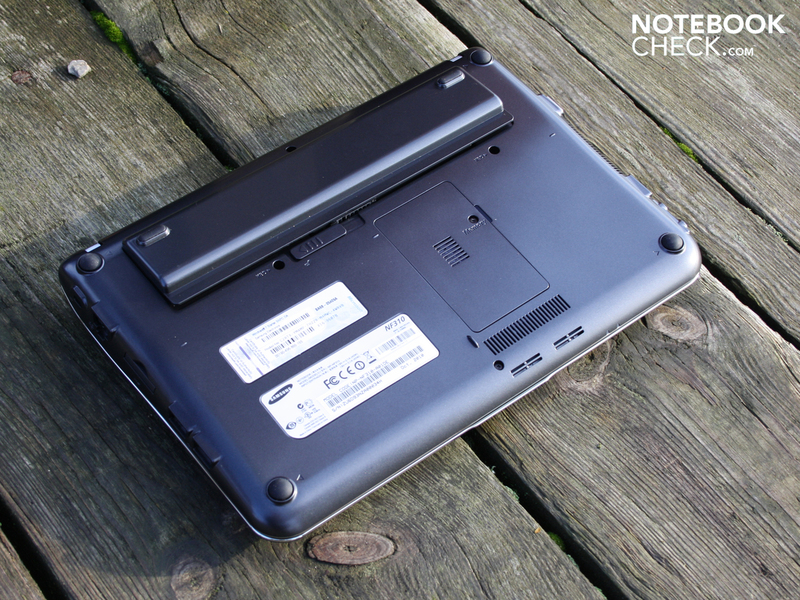 Netbooks with the N450 (e.g. Samsung N230-JA01DE/SEG Storm) lie at 1266 points. 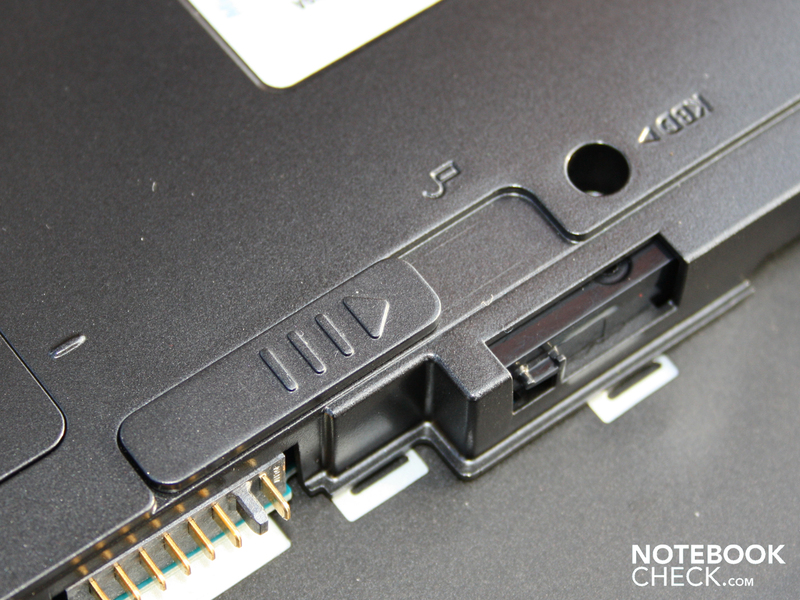 If faster DDR3 RAM comes in to the picture through the N455, this has also not led to more points in our previously tested devices: 1160 points (Aspire One 533-13Drr). Summary: Our N550 system is 31 percent faster than the best single core system. 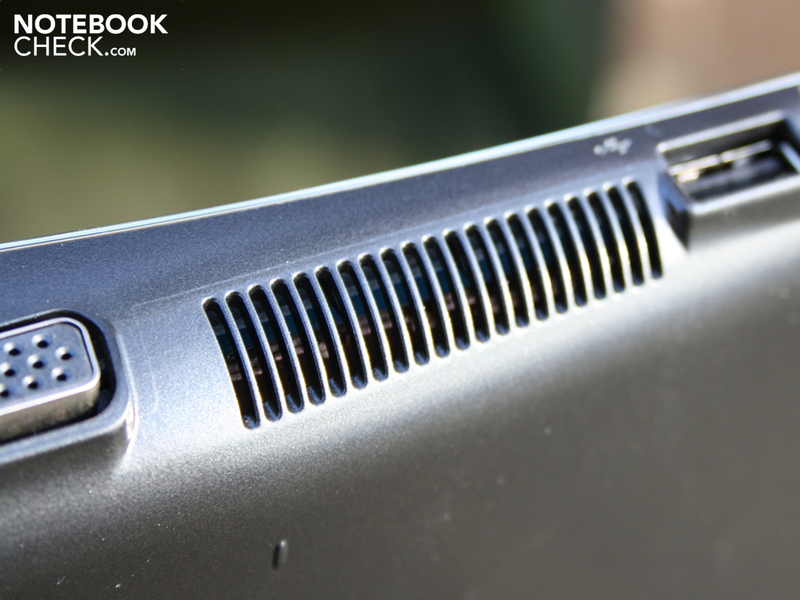 The AMD Netbooks can keep up, as long as a Athlon K125 (Aspire One 521) is included: 1686 points in PCMark Vantage. The V105 (Eee PC 1015T) is slower with its 1360 points though. The advantage of the AMD solution is the HD graphics card ATI HD 4225, and a HDMI output. The Hitachi hard drive (type HTS543225A7A384) with 250 GBytes works with a rotational speed of 5400 RPM. HD Tune determined an average transfer rate of 52.6 MBytes per second (sequential read). This data rate is clearly below the mid-range of comparable 2.5 inch hard drives in Netbooks and also Notebooks (approx. 65 MB/s). The access time of 19.1 milliseconds also has to stand at the back of the line of other rotating hard drives. Fast 5400 RPM HDDs can reach 16.9 ms (Dell Mini 1012). Those that wish to increase the 250 GB will not have a panel available for access. Due to the fact that the bottom of the chassis forms a single item, it is likely that the keyboard and the cover plate will also have to be removed. We were not confident enough to carry out this procedure though, due to the lack of clear instructions. The HD Ready display (1366 x 768) allows for perfect movie watching. Unfortunately the hardware decoding of current HD videos is not supported by the GMA 3150. The ultimate for movie fans? Only partially, since the N550 with its four processed threads helps out, and allows for H.264 coded HD videos with 720p (1280 x 720 pixels) to be played smoothly. The playback is not completely judder free (approx. 85% CPU load) and the best results are achieved when playing back from the hard drive. YouTube videos (720p), played on the website, run smoothly. The performance is about identical to the Aspire One D255 (N550), which only has a WSVGA resolution though. A comprehensive gaming test of the N550 + GMA 3150 combination has already been completed for the Asus Eee PC 1015PEM. Older as well as current games already proved to be unplayable (9 games from Doom 3 to StarCraft 2). A better performance as a result of the two cores only turned out to be the case for Trackmania Nations Forever, which was still not playable though. Samsung doesn't give up on the gaming theme so easily though, and installed two 2XL games (demos): Supercross (2009) and Trophylite Rally (2010). Using the highest settings both run smoothly, which is no surprise though, considering that they are iPhone suited games. The graphics look correspondingly modest. Altogether we are dealing with a very quiet 10.1 inch Netbook. When surfing the web, writing emails, or typing in Word, we are not molested by a loud cooling fan: 31.6 dB(A). On the contrary, during less demanding tasks or when in an idle state, the cooling fan switches off completely for longer periods (30.2 dB(A)). Depending on the sporadic demand of the processor, this can be anywhere from a few to ten minutes. The hard drive can be noticed by a sporadic high frequency fine clicking from the read and write heads: 31.2 dB(A). During constant load the NF310 is only marginally louder. During a 3DMark2006 (GMA 3150) test we measured only 31.6 dB(A). 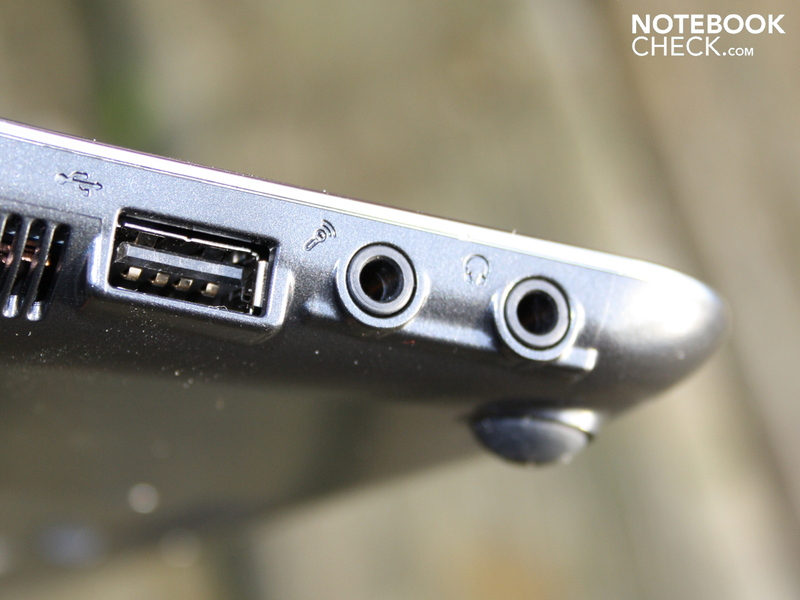 The 10 inch Netbook is therefore no louder during the 3D benchmark, than when in office use. The stress test, during which the processor and graphics unit are fully utilized, drives the cooling fan up to only 33.3 dB(A). The sound is a high frequency consistent noise. The Samsung Silent Mode (Fn+F8) was not activated for the measurements (silent, normal, speed). 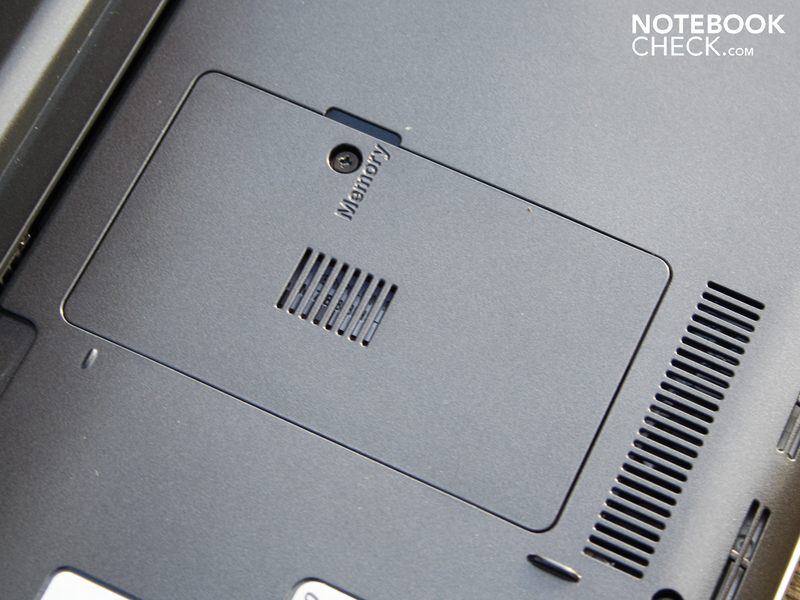 The Silent Mode switches the cooling fan off constantly. It only comes back on when the processor gets too stressed, or if the temperature becomes too high for another reason. The maximum noise level can be effectively reduced using this. Using the Speed Mode the cooling fan runs constantly, so that it does not switch off in an idle state. The heat dissipation stays low in every operating state (idle, stress). While surfing the web and word processing, hence during low sporadic load, the average temperature on the bottom surface lies at 28 degrees Celsius. The area around the palm resting area stay cool with about 10 degrees above room temperature. The load exercised by the Prime95 and 3DMark06 tests hardly cause the top and bottom surface temperatures to rise at all (compared to idle). What's the reason for the bottom to stay at an unchanged 28 degrees? When in an idle state the cooling fan doesn't turn, which is why warm air stays in the case. When the cooling fan is active due to a higher load, this blows the warm air out of the case, which is why there is even a cooling in some areas. (+) The maximum temperature on the upper side is 31.2 °C / 88 F, compared to the average of 33 °C / 91 F, ranging from 21.6 to 53.2 °C for the class Netbook. (±) The average temperature of the palmrest area of similar devices was 29.3 °C / 84.7 F (-1.9 °C / -3.5 F). Samsung goes out on a limb with its "3D SRS Premium Sound", that supposedly provides for "a enhanced bass, and crystal clear dialog as well as [..] ideal sound control". We presume that the manufacturers website simply copied the texts from that for the bigger Notebook. The sound may not be the worst, but claims of an "enhanced bass" and "crystal clear dialog" are unsubstantiated. The soundscape with its mid and high range is thin, and low frequencies are negligible. The above mentioned bass couldn't be detected with any music by us. The stereo speakers are located above the keyboard. The SRS Premium Sound (improvements, activatable) led to a constant changing of the volume with some songs (negative). Altogether the SRS sound makes for more balanced acoustics though. At least the sound is clear and undistorted at high volumes. Using external speakers we experienced noise free music with a strong output signal level (no measurements, only listening test). 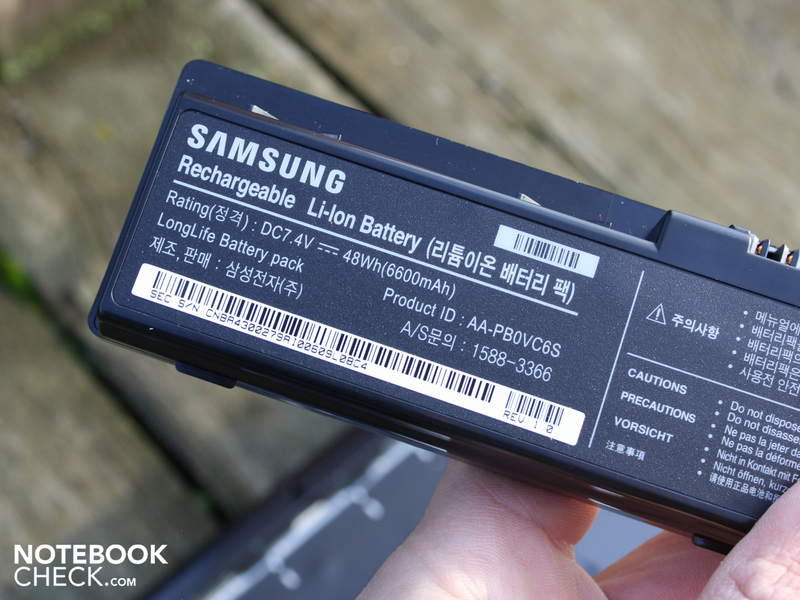 Samsung speaks of 9.4 hours battery life according to BatteryMark. We do not use this benchmark, but an idle state battery life of 9.25 hours can confirm this claim. This idle state battery life using the lowest brightness setting with deactivated wireless modules is however not a real value in practice. More relevant for day to day use is the WLAN test with a good 5.42 hours. This is exactly the battery life of a N455 single core Aspire One 533 (5.49 hours, 49 Wh). 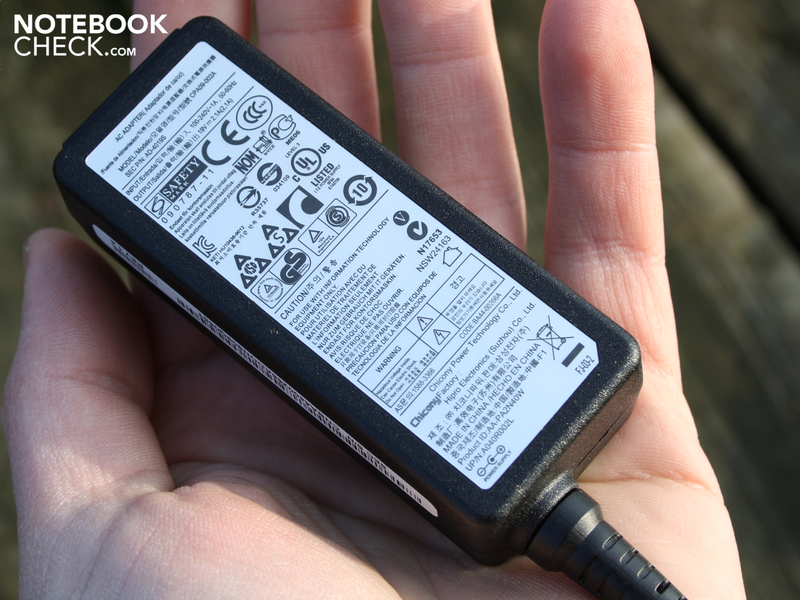 The N450 colleague reached six hours in an Asus Eee PC 1001P (48 Wh). It takes 2.32 hours to charge the battery, before the session can continue. Things look much better when it comes to playing back movies from the hard drive (low quality, AVI file, not H.264). The 10.1 inch Netbook holds out for 7.32 hours. The brightness of the TFT was only set to 100 cd/m², and the wireless modules were deactivated. Under the maximum load (BatteryEater Classic) the battery life reduces to 3.51 hours (wireless active, brightness maximum). In this case the single core performs a little better with 4.27 hours (Aspire One 533), thanks to the three Watts lower TDP. 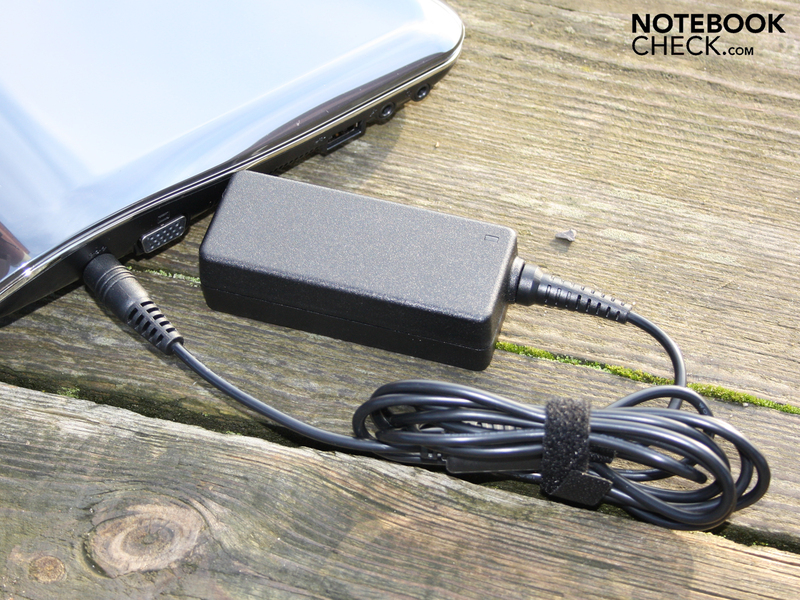 The NF310 has a higher Netbook power consumption. In every operating state we measured a few more Watts from the power socket as opposed to comparable devices with single or dual core Atom. The power consumption in an idle state lies at only 8.9 Watts (minimum brightness, energy saving mode, wireless disabled). A N450 is more frugal with 6.2 Watts (Samsung N220). But the same Dual Core N550 can manage with 4.3 Watts (Acer Aspire One D255). The idle battery life of the D255 is therefore correspondingly longer with 11 hours. The maximum power consumption of 17 Watts fully utilizes the TDP value of 8.5 Watts (Prime95 on all four threads + 3DMark06). 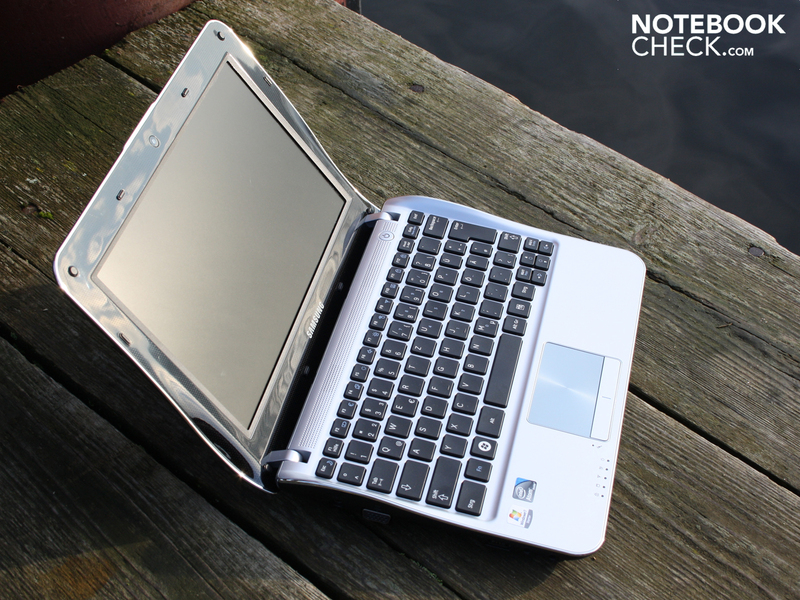 N450/N455 systems lie at 12.5 (Eee PC 1001P) or 13.6 Watts (Aspire One 533) in this case. 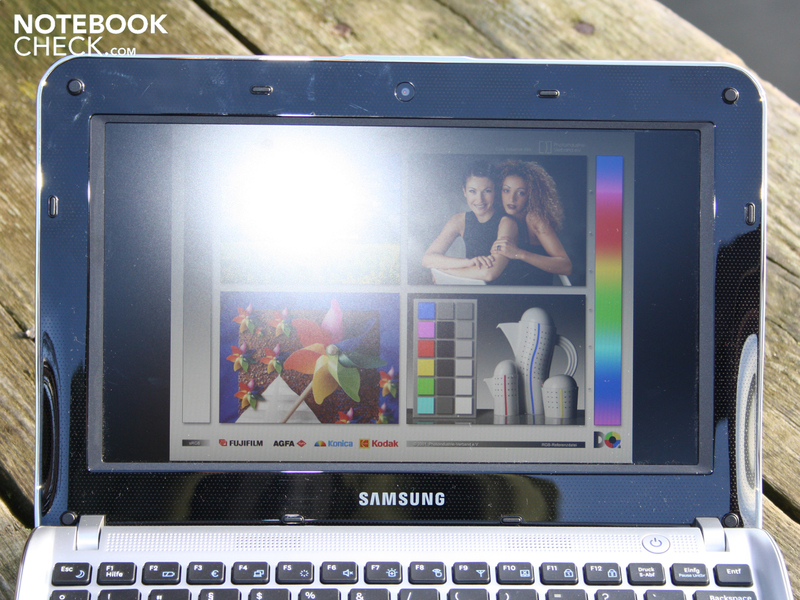 The D255 (N550) however shows that a two core Netbook can manage with 14.4 Watts (lower TFT brightness). The 40 Watt power adapter weighs a mere 173 grams. It can easily provide the maximum power consumed in addition to charging, which is why it only heats up to 32 degrees under a high load. 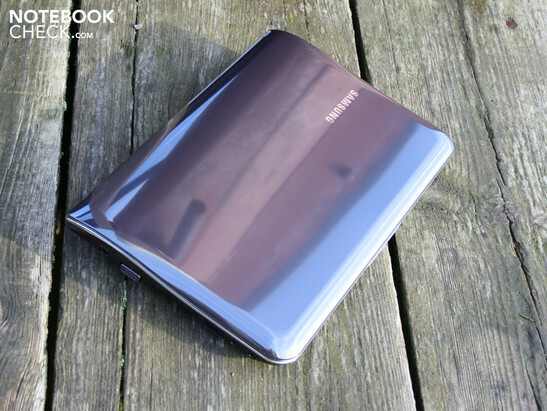 Samsung has assembled an optically and technically interesting 10.1 inch Netbook for 395 Euros with the NF310. The performance advantage (57% CPU benchmark, 31% total performance) thanks to the Atom dual core N550 (2 x 1.5 GHz), makes a good impression providing for smoother operating compared to the N450/N455. The missing hardware support of the GMA-3150 graphics however still prevents smooth representation of high resolution 1080p videos. The maximum possible 720p played back from the hard drive, is just about possible with a high CPU load. Concerns regarding a shorter battery life due to the more power hungry dual core turn out to be unfounded (WLAN surfing 5.54 hours). Our previous Dual-Core Atom test devices have not shown shorter battery run times compared to their single core colleagues. Merely when under a constant load the battery life of an N450/N455 is somewhat better. During a practically realistic surfing the internet test, the battery life is more or less identical. If there are differences, then these are likely to stem from different battery capacities. The non-reflective HD Ready TFT not only provides good oversight with its high resolution (1366 x 768), but also a very good brightness of up to 246 cd/m². The next summer can't therefore come too soon. The extravagant design is also a plus point should users wish to be conspicuous. 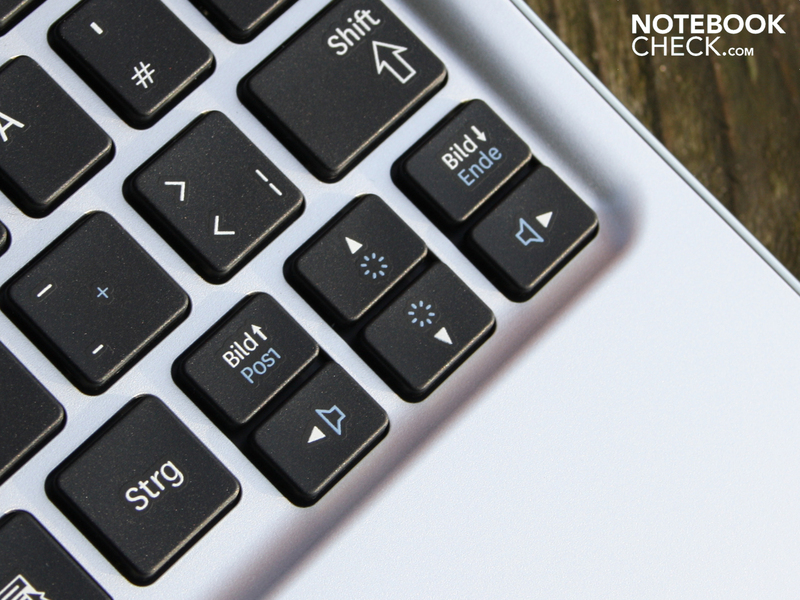 The touchpad is easy to operate, although the well laid out keyboard is missing a good feedback due to an unclear pressure point. Audio performance is limited due to the lack of bass, but mid and high range frequencies are represented half way decently. Thanks to the strong battery run times this was just about enough for a very good for us. Perfectionists that are still missing the HD graphics card should take a look at the Asus Lamborghini VX6, the Aspire One 521, and the Asus Eee PC 1015PN (see "The Competition" on the right). The latter two of these are however missing the attractive HD Ready display. Samsung NF310 N550 (NP-NF310-A01DE): The HD Ready display gives oversight and the Dual-Core makes working more pleasant. More than style and maximum mobility. 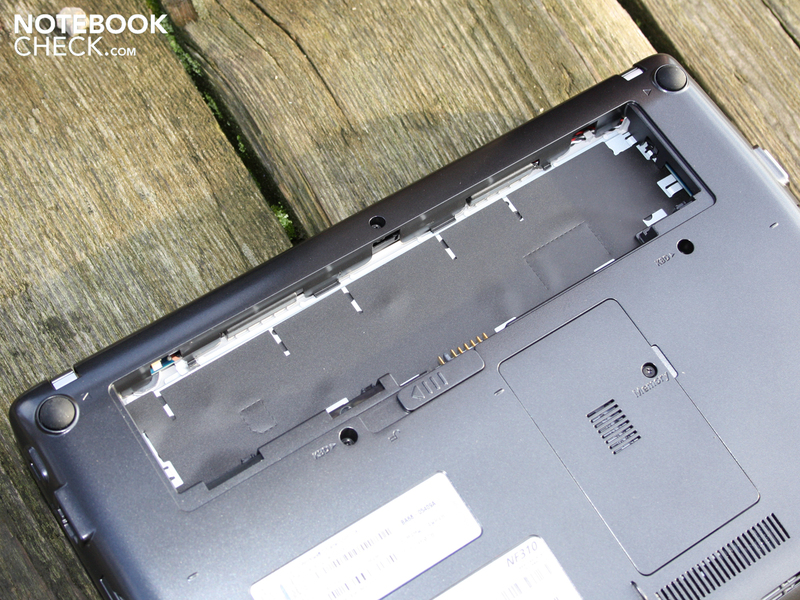 The bottom of the Netbook consists of a smooth, varnished plastic. and this leads directly to the DDR3 RAM (1 socket). but also sprung out mechanically (cumbersome). "up to 9.4 hours" of battery life (BatteryMark). There is no media included with the accessories. 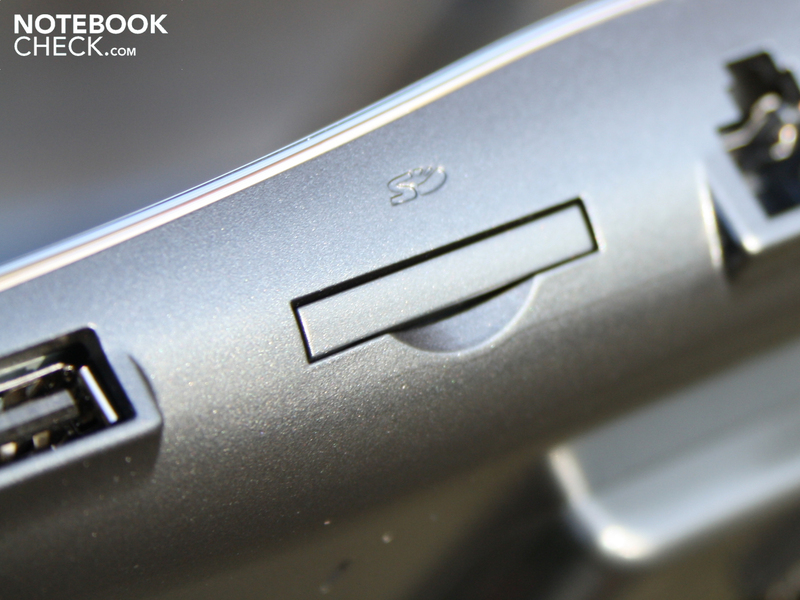 Samsung NF310: Users will definitely catch eyes with the shark-design. 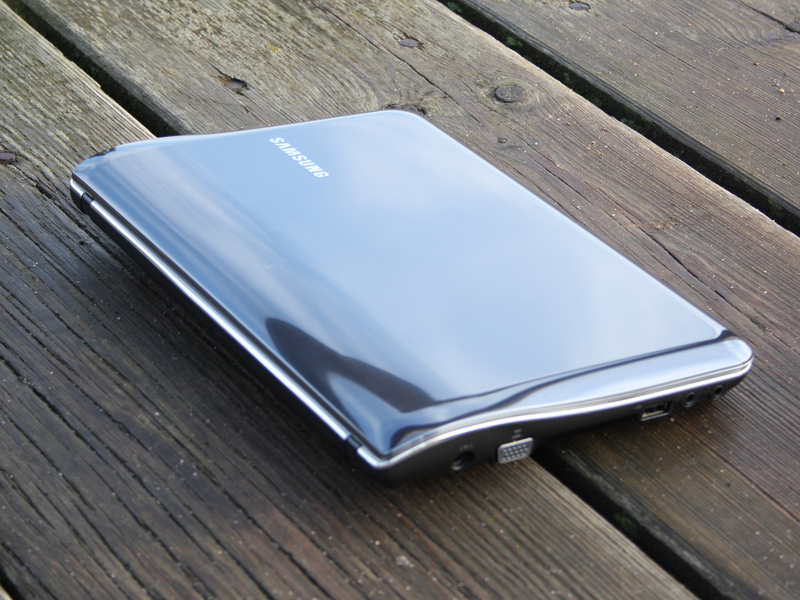 Samsung NF310: The case is sufficiently stable but not perfectly rigid. 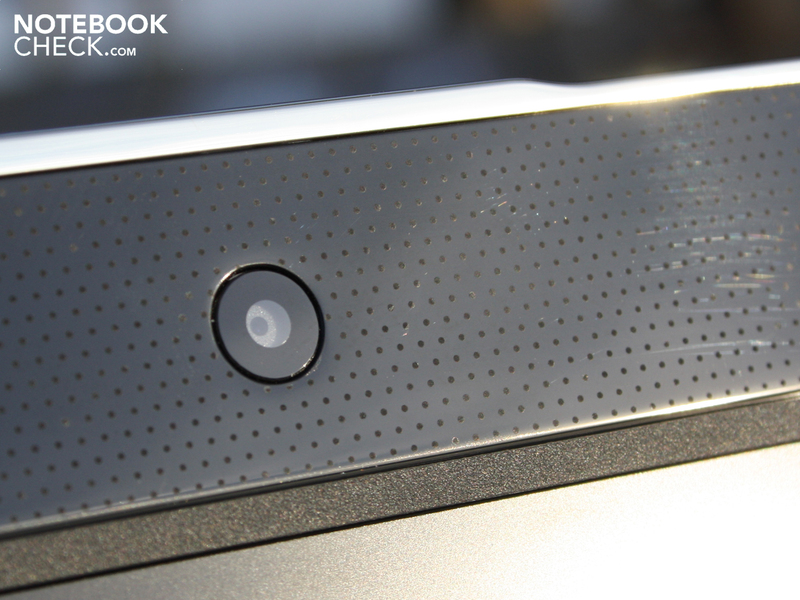 Finger prints are not left behind on the matte finish. These are the basis for the shark-design. 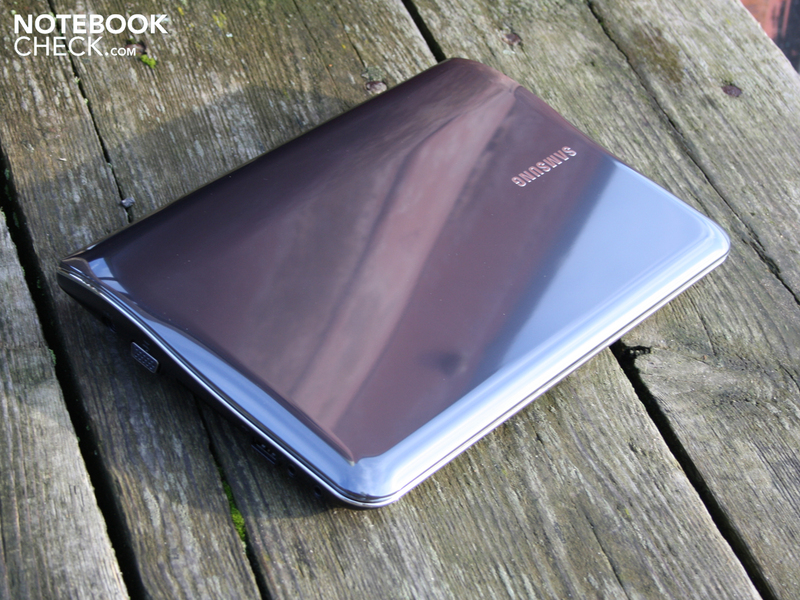 This is promised by Samsung with its Netbook series NF-310. In our test, the NP-NF310-A01DE with Dual-Core Atom. 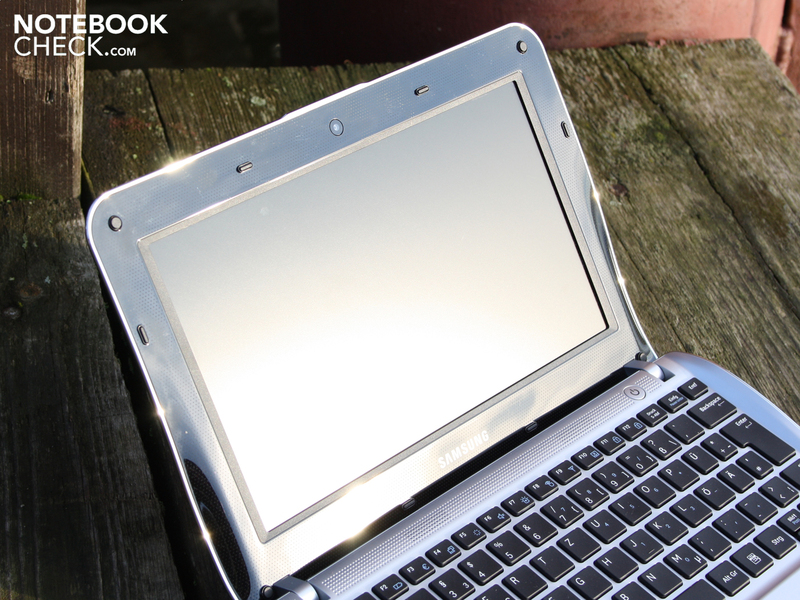 The 10.1 inch Netbook has a non-reflective HD Ready display (1366x768). The silver-gray coloring supposedly provides "a positive attitude". are not unattractive (power button). The stereo speakers sit above the keyboard. The display frame is covered in fine bumps. This prevents finger prints. as well as on the raised edges. are surrounded by swinging raised edges. 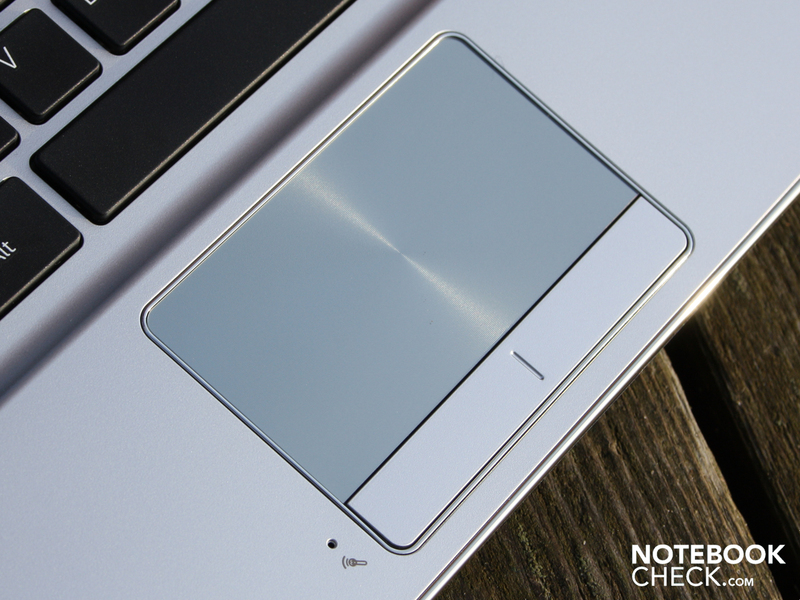 Samsung NF310: The metallic appearing touchpad doesn't hold finger prints. Bright, matte, and with a high resolution - what a 10.1 inch panel should be like. And now a little Nvidia ION 2 graphics, that would have been the perfect Netbook heavy weight. Good battery run times, as with the single core Atom. Dual Core alternatives: Asus Eee PC 1015PEM: matte display; Asus Lamborghini VX6: Nvidia Ion 2 & Atom D525; Asus Eee PC 1015PN: affordable Ion 2; Acer Aspire One D255: strong battery life. AMD Single-Core: Asus Eee PC 1015T: less battery life but more HD support; Aspire One 521: K125 with more performance. Small sub-Notebooks with 11.6 inches: Acer Aspire 1551 (Turion II Neo X2 K325) from 460 Euros; Acer Aspire TimelineX 1830T (from Pentium U5400) from 480 Euros; Lenovo U160: from 450 Euros.